Ugh, want to make a poll but too lazy and can't think of anything right now. Harassed this thread about this for a bit, because I didn't want to make a topic on it. There's many ways for expression to take place in the game. A pixel can do a lot. Text, Animations, Voice and still pictures/portraits. All tools for a more "representative" experience of the expression the Companion (or your character) is doing. In the attachments below there are some Examples of what I'm flirting with. JRPG's and Anime use lots of "emoticon" stuff that might not completely belong in Project: Eternity (I'm personally not ruling it out, perhaps there is a way to make it super goed in a realistic and acceptable way). EDIT: Less voice-acting required as the bodily language is conveyed through the facial portrait expression, however it could reduce a few sentences of text in the Dialogue Log because the Writer wouldn't need to write the characters "expressions" every time. Edited by Osvir, 12 November 2012 - 01:17 PM. For me, the text in planescape torment did all I wanted. As far as emoticons or even the portraits changing like in japanese games, well, I have never actually played a real japanese rpg, but I have played some flash games and that was only appropriate for a silly (way silly, not good silly) storyline. No need for over-the-top emotions imo. "Expression" should be narrative and/or dialogic, IMO. Like PS:T or BG's affected dialogue with only initial voiced lines. Look, I know you want full VO and all that, but the less "automated creative handholding" the player gets, the much better it is for letting our imagination actually work. 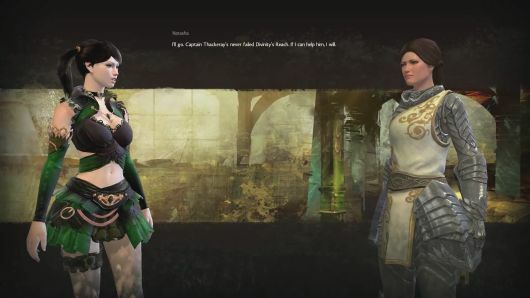 The problem with current action CRPGs like Dragon Age is that they take all the creativity away from the player by using full VO, cinematics, and expressive heads, all of which strip text content. I don't want to be patronised. The only "expression" in character portraits I'd tolerate is the health/damage in PS:T.
I... dont think it's a good idea to mix western RPG and JRPG approaches to character presentation. Assuming that characters will get highly detailed portraits and PST style text descriptions I doubt anything else will be necessary. Took a little smudging there, a pixel or two. I barely did much to provide with the examples (on a touchpad mouse). A professional would probably be able to dish these out like.. like... uhm I don't have a good analogy... like a professional would. Took me about 5-10 minutes on each of the examples (on a touchpad mouse). I do agree, I am just curious if it could work. I don't think it's a matter of resources Osvir, I think it just makes the game silly / is unnecessary. But Western style games have used them too. Disciples II, which is where the middle picture comes from, has a great aesthetic style for those looking for a Western take on the fantasy comic book aesthetic. Edited by Azarkon, 12 November 2012 - 03:19 PM. I don't like the idea of little portraits next to the text dialogue. For one thing, it (often) takes up too much extra space. For another, it's repetitive to see the same pictures for every line of dialogue. Even if they had a set of several different ones (angry, sad, smiling, bloody-injured) it's still repetitive and distracting. And often kinda corny. Josh Sawyer has said that they'd consider portraits with different expressions for NPCs. Doing it for the PC would, of course, be... problematic. I'd be cool with that. Plenty of JRPGs have used that sort of thing well. I'm fine when you click on a merchant or a quest NPC and a dialogue window popup box with their mug in it in a corner pops up, or whatever. I just don't want to feel like every time I click on someone to "speak" to them, or every time my companions decide they want to have a chat, that I'm tossed into/stuck in some special window. Personally, I like the idea of having a portrait of the speaker next to their dialogue and there being several variations of the portrait (at least for major characters) to show different emotions and states of being. I thought that approach worked well in Persona 3 and gave its dialogue a nice sense of dynamism. That said, since some people seem to be very opposed to this idea, a strait-up, plain dialogue box like in Fallout or the IE games is probably the better way to go. Edited by eimatshya, 12 November 2012 - 04:12 PM. I'm fine when you click on a merchant or a quest NPC and a dialogue window with their mug in it in a corner pops up, or whatever. I just don't want to feel like every time I click on someone to "speak" to them, or every time my companions decide they want to have a chat, that I'm tossed into/stuck in some special window. Totally situational and for V.I.P's if anything. NPC's, some merchants (not all), when an event happens in the game, for story, etc. etc. Commoners and the like would and should stay true to their roots (like in BG, only in the Log window) if a dialogue thing is considered to understand your companions and the world. I think it is a good idea. The persona games do this quite well like some other posters have said and it can't possibly be that hard to make some additional static images from characters in PE. Personally I would still rather see well made 3D character models that are capable of showing emotion and moving hands and such as "pop ups" during conversation. It just needs to be the active speaking character always with the main character on the side, perhaps sometimes the main character gets supplanted depending on who is speaking. Basically what you see in Folklore, or more recently, Guild Wars 2. Edited by Karkarov, 12 November 2012 - 04:46 PM. Exclamation bubbles, question mark bubbles. A teardrop etc. etc. In one game the teardrop kind of falls down into the talk bubble, the exclamation flashes into view and the question mark kind of wobbles, all part of the "effect" and a representation of a feeling of expression. Body movements would be fun to see. While I do love when a JRPG has character portraits that change based on the dialogue I don't think such a thing fits in with this game. For example in a lot of JRPGs you'll get characters with portraits or full characters who have different expressions for a variety of emotions. Usually angry, scared, sad, embarrassed, ****y, ect. While I do enjoy these in JRPGs I think that with the tone of this game we won't be seeing simply drawn character portraits. I think it's more likely that they'll have fully painted portraits such as they had in Baldurs Gate and Icewind Dale. Changing the expression/poses on those sorts of portraits is a bit more involved and therefore expensive. So I imagine for budget alone this wouldn't be a real possibility if they wanted to keep that sort of artistic fidelity in tact. So the next option that wouldn't involve repainting a plethora of extra emotive portraits for companions and PCs would be to simply go the emoticon route. While this is inexpensive to implement I feel that it breaks immersion when present in games. While I don't strictly mind it when I'm replaying Grandia or Breath of Fire I'm also a bit more removed from the world in those games. I'm playing a set character and the outcome in the game is always the same so I don't mind them breaking immersion a bit because I'm not as invested in feeling a part of the world while I play. I really wouldn't want a portrait like those from BG to suddenly get tear drops placed over them or that little angry forehead vein commonly used in more anime style games. I just don't seem the styles blending together well. So I say just make sure the dialogue box is more than just dialogue. Write descriptions of what the character is doings while they talk, how they look, the tone they're saying it in, just as you would in a book. 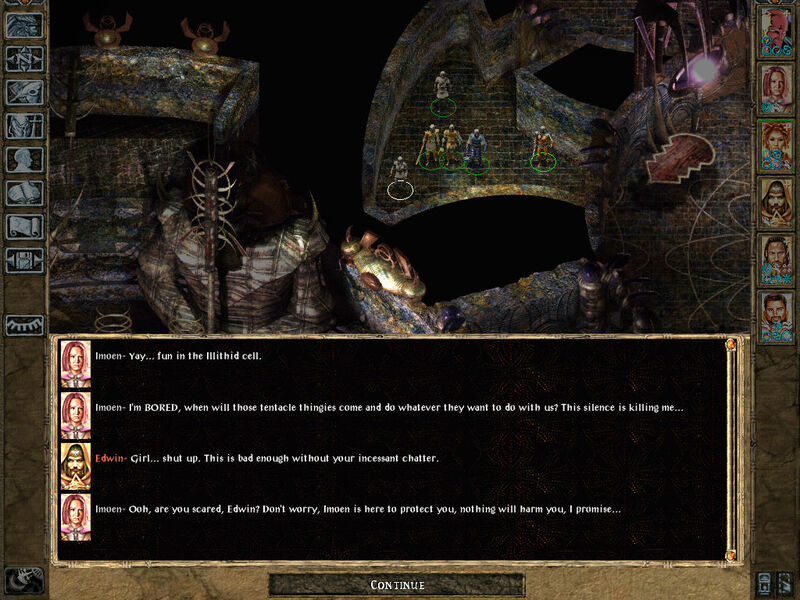 While this might be 'wordy' for some I know it's one thing that people really loved about Planescape Torment and personally I think it's the right way to go in a game like this. I'm reminded a little of some of the older cRPGs where the facial icons could express sickness, pain, and so forth. But I'm starting to agree with some of the posters above that it might not work well with this style of game. Well-written text can communicate emotions quite effectively, as can colors and sounds to some degree. I personally don't like the idea because I could see the log getting a bit cluttered. 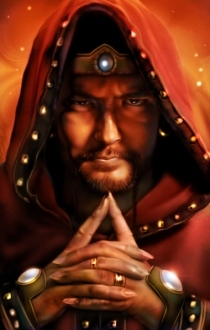 I personally prefer the mini-portraits (used in Baldur's Gate with mods), we'll see if EE is using it or not (On/Off button?). Edited by Osvir, 12 November 2012 - 11:48 PM.